Materials: Hand Spun and Hand Woven Sheep’s Wool from Morocco, Shrunken Black Designer Wool. 90/10 Feather Down Pillow Inserts. Visual, 17” x 17” approx. Description: This Pair of Ethnic Pillows are Made from Hand Spun and Hand Woven Natural White and Natural Black Sheep’s Wool. An Outstanding Geometric Weave Moroccan Textile, Well Designed, and Tightly Woven. A Heavy Designer Wool Fabric Remnant, Shrunken, is Used for the Pillow Backs as well as the Hand Cut Fringe Detailing. A One of a Kind Pair of Eco Friendly Decorative Pillows with Feather Down Inserts and Hand Stitched Closure. 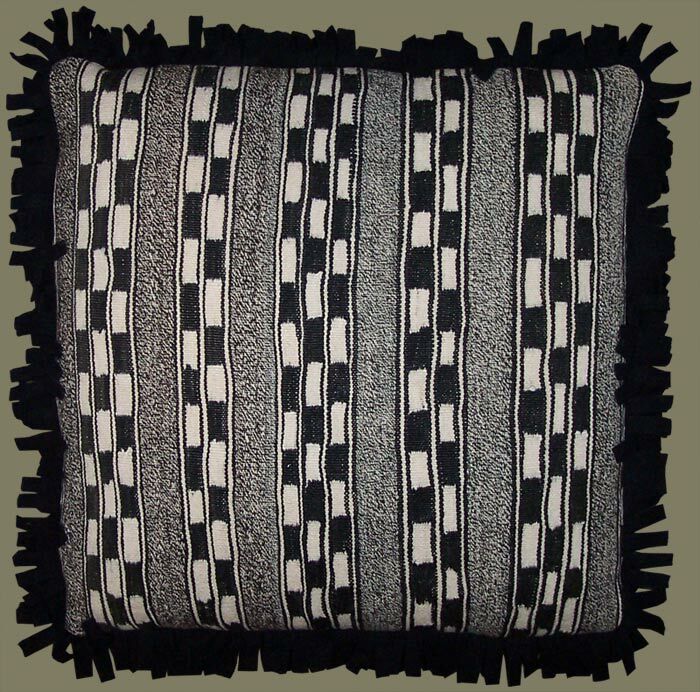 These Decorative Artisanaware Pillows Would be Stunning on a Black Leather Sofa or Chairs, and Surrounded by Other Furnishings, Collectibles, and Accessories Playing on the Black and White Theme.